People of the Mountains (Emberek a havason) on dvd August 29th. Arguably the most gifted Hungarian filmmaker of his generation, István Szõts has been compared by critics to Ford, Vigo and Renoir. His forgotten masterpiece, People of the Mountains, is the story of a woodcutter and his family who live high in mountains of Transylvania. Forced out of their home, they are enticed into working for the very company that ejected them, only for their lives to begin to unravel one tragic misfortune after another. Shot almost entirely on location (in the harshest conditions imaginable), using mostly non-professional actors, a devotion to realism and the details of daily life, and an indictment of the prevailing conditions, this was a groundbreaking film. Szõts auspicious debut was, however, refused a distribution license by Nazi minister for Propaganda, Joseph Goebbels and condemned as 'Communist propaganda'. In spite of this, the film went onto to win a major prize at the 1942 Venice Film Festival and later cited as an early model for the post-war Italian Neorealism movement, praised by Vittorio De Sica and Cesare Zavattini among others. A powerful, elemental vision suffused with poetic lyricism and a romantic anti-capitalist zeal, People of the Mountains is the jewel of Hungarian cinema of the period. People of the Mountains (1942) - presented from a brand new 2K digital restoration of the film from original nitrate image and sound negatives, supervised by the Hungarian National Digital Archive. Original Hungarian soundtrack in mono audio. Is this the oldest film Second run has released? I'm happy to see somebody release pre-'45 film from Eastern Europe which is largely a dead zone on english language disc. Yes, the earliest titles before this were Eroica and Night Train from the late '50s. Wow! Keep it coming, Second Run! It's also the second oldest film to be included on the so-called "Budapest 12" list of the greatest Hungarian films ever made (according to a 2000 poll of Hungarian critics). 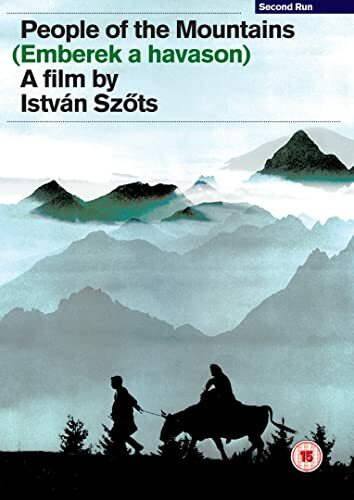 One of the more recent MaNDA DVDs, István Szőts’ Men in the Alps (Emberek a havason, 1942) – other English versions replace “Men” with “People”, “in” with “of” and/or “Alps” with “Mountains” - offers a model example of presentation standards. The film has been largely neglected internationally since its 1942 Venice Film Festival screening made a deep impression on future Italian neorealists, but it’s retained a substantial reputation at home, to the point of being ranked fourth on the ‘Budapest 12’ critics’ poll conducted by Hungarian critics in 2000. (Jancsó’s The Round-Up/Szegénylegények, 1965, came first – this is as yet unreleased by MaNDA on DVD but a new restoration premiered at Cannes 2015). The title is presented in Hungarian on the menu, but the viewing options are bilingual, and the main feature comes with English subtitles. The film is mostly set in a remote Transylvanian community into which a Hungarian woodcutter has resettled with his family in the hope of a better life than the one that he has endured thus far. The first half is undoubtedly what gives the film its lasting reputation, as its rhapsodically lyrical portrait of a long-vanished way of life, where ancient pagan rituals hold as much sway as Christianity, gives way to the encroachment of industrialisation and the cataclysmic impact that it has on traditional professions and crafts. The piling up of tragedy upon tragedy in the second half teeters on the edge of melodrama, but it’s easy to see why the French critic Philippe Haudiquet compared Szőts with Dovzhenko, Ford and Renoir. Sadly, Szőts only made one more feature before joining a creative exodus of talented Hungarians in 1956 following the Soviet invasion. Will definitely pick this up. And thanks for that list Michael. Any chance of the extras from the MANDA disc? Are they subtitled in English on their disc? They're unsubtitled on the Hungarian disc. So I guessed, as it is a lower tier priced disc. "A masterpiece... It looks magnificent, with a rare quality of light that simply glows in this new restoration. It is, then, an astonishing accomplishment. It’s also a happy reminder of how much wonderful cinema there remains for us all to discover." "István Szöts’s stark, startling slab of rural realism People of the Mountains. Now given a digital restoration from the original nitrate print, it’s a true discovery. Earthy and ahead of its time, this poetic defence of unconsidered lives still bristles with feeling." "This gorgeous film has been fabulously restored so the blacks smoulder and the whites ping." This "gleaming digital restoration... What's most striking is the sheer beauty on screen. An impressive, worthwhile discovery"
Any plans to upgrade this to Blu? I saw this for the first time earlier this month and it is probably the best Hungarian film ever made, Budapest 12 title as well. Maybe you could include the beautiful short Kádár Kata as an extra which is on the Hungarian DVD without subs but the actors and actresses don’t speak any dialogue although there is some singing in the background. I would imagine any title released after or near to when Second Run started releasing BDs is very unlikely to be upgraded just because they probably have a lot of surplus stock, they already made a determination that the BD wasn’t viable, and that most of those who did buy would be put off buying it again so relatively soon after.